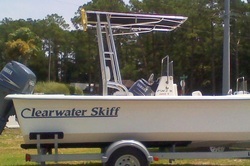 Cape Point Custom specializes in high-quality boat tops for all types of boats. 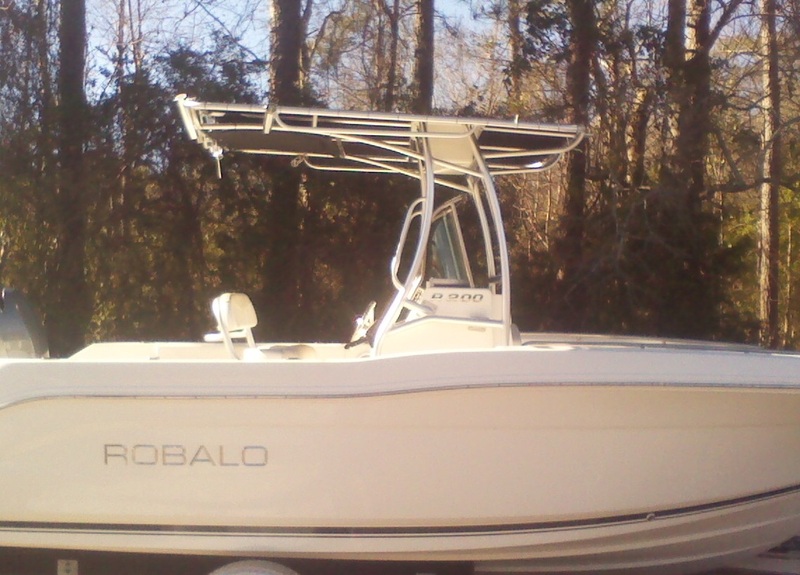 Since each customer and boat is different, we also handle custom orders. If you do not see a product here to suit your specific needs please contact us--we are happy to work with you to create something unique. Our tops are built of either polished or brushed finish anodized aluminum. The legs are made of 1-15/16" O.D. schedule 40 pipe--not the smaller pipe found on the mass produced factory tops. We make out top sections out of 1” O.D. pipe to keep the upper weight to a minimum. Our tops are built to be strong enough to handle mother nature's fury. We use large pipe for the front crossbars to prove stability. At Cape Point Custom we are so confident in the build of our tops that we offer a lifetime warranty on workmanship. 6Our standard T-Top includes 5 gold or silver rod holders on the back, 2 light brackets, antenna mounts, and your choice of canvas color. Price includes installation. Standard tops are $1,800 including tax. Or you can choose to get the deluxe model shown below for $2360 total. 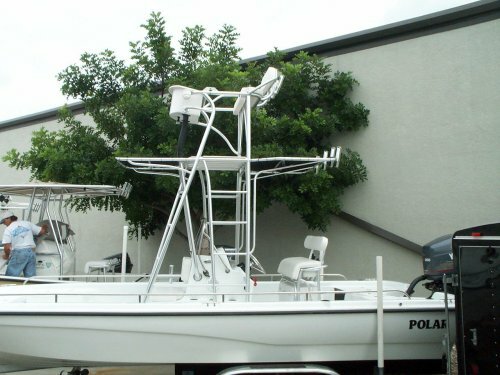 Below is a picture of a deluxe top.They have the sweeping(radius)curved legs rather than the bent legs.This option is an additional $150.This one has an electronics box(add $300) ,a life jacket bag($175) and the two side trolling rod holders The total cost was $2325. 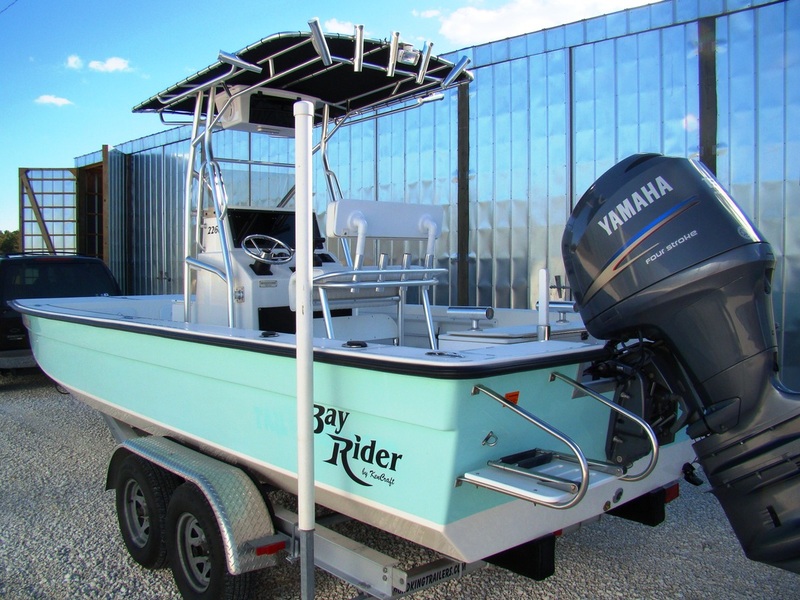 Custom Tops for cuddy and walk-thru boats are made of the same top quality pipe as our T-Tops and include 6 rod holders (gold or silver), antenna mounts, 2 light brackets and canvas top all installed. Base cost $2200 plus tax. There are also some optional accerssories such as: Electronics Box ($300), Deck Lights ($42), and Additional rod holders ($32 each). Custom Fabrication $50 per hour. The foldable/removable fisharch is designed to provide maximum shade, allow you the ability to fish or troll, and to fold for easy storage. 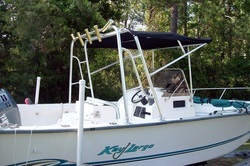 Included on the fisharch are 5 rod holders, a retractable bimini-style cover and gunwale mounted pivots. 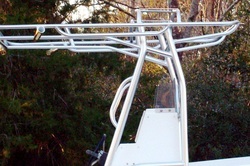 Crows nests are built to fold down for trailering and are removable by simply removing two bolts in the front.For one on a top that we build the cost is $800 extra.For one made for your existing top it would be priced by options on it and the time it takes to make and install it.All crows nests(most folks call it a cobia tower) fold down for trailering,come with a backrest and a seat cushion,and have 2 rod holders designed for spinning reels. This seat top is designed for those who want a new seat and a T-Top for the same cost as a T-Top alone. 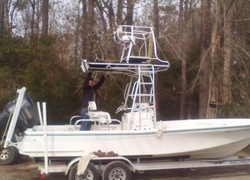 It includes 5 rod holders, seat cushions, antenna mounts, and 2 light brackets. Made in either seat height or lean post height. 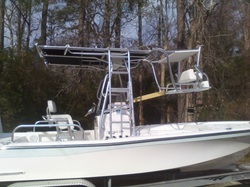 Cobia towers are another popular option rather than a t top/crows nest combo. The upper part folds down for trailering.In most cases a customer has their own ideas of the things they want so they are priced per customers needs.